When is the best time to visit Six Flags Magic Mountain? Known as the “Thrill Capital of the World,” Magic Mountain is located north of Los Angeles and, unlike other Six Flags parks (besides Discovery Kingdom), is open year round. 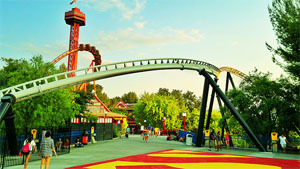 The park features 44 rides and an impressive collection of 13 roller coasters, the most in the world. Six Flags Magic Mountain attracts millions of thrill seekers every year, making it one of the most visited theme parks in the world, but when is it least crowded? Here are some of the best and worst times of the year to visit the park. New Year’s Day – The bulk of the holiday season crowds are traditionally gone on the first week of the New Year. Crowds and lines are usually manageable again on January 1, as the off season begins. MLK Weekend – Weekends in January aren’t too crowded at Magic Mountain, but it does tend to get busier for the three-day weekend. Crowds are very manageable on MLK Day itself. Super Bowl Sunday – Disneyland might be busy on Super Sunday, but crowds at Magic Mountain are usually light. Presidents Day Weekend – The off season continues into February, with manageable crowds on Saturdays and Sundays. Presidents Day Weekend typically draws big crowds, however. Presidents Day itself is traditionally manageable. Spring Break – Be prepared for Six Flags to get busier for the Spring Break season starting in mid-March. The end of March marks the beginning of daily park openings, and weekdays (Monday – Friday) are your best bets for lighter crowds. Saturdays and Sundays are usually packed, with the Spring Break crowds peaking on the week before Easter and the week of Easter. Weekdays – Attendance drops after the Spring Break season, so crowds are usually light on weekdays. Weekends are still busy, with Saturdays being most crowded. Memorial Day Weekend – The holiday weekend marks the start of the summer season as schools start to get out. That Saturday, Sunday, and Monday are usually very busy, so try to go on the weekdays after Memorial Day if you can. Summer Season – Try to go early in June to avoid the brunt of the summer crowds. Aim to go on weekdays on the first two weeks of the month. By mid-June, most schools are out of session and the summer crowds are out all week. Weekends are most packed. 4th of July Weekend – Magic Mountain is traditionally very crowded for the 4th of July, so try to arrive early. July is the busiest month at Six Flags, so there’s not much relief from the summer season crowds. Avoid the weekends if you can. Summer Season – The summer crowds are still out in most of August, but start to die down by the end of the month as schools get back in session. Crowds are usually light on weekdays on the last two weeks of August. Labor Day Weekend – The crowds are back for the holiday weekend, so plan on the park to be busy on that Saturday and Sunday. Labor Day itself is traditionally manageable. Magic Mountain is only open on weekends in September, and Saturdays are usually busy. Sundays are your best bet for short lines. Fright Fest – The annual Halloween events takes over Magic Mountain in October. Try to go early in the month if you can, as it gets busier closer to Halloween. Saturdays are usually packed, but Fridays and Sundays tend to be more manageable. Try to get there early! Veterans Day Weekend – Crowds pick up for the holiday weekend. Saturday, Sunday, and Monday (Veterans Day) are usually packed. Saturdays are usually crowded throughout November, while Sundays are manageable. Thanksgiving Week – Magic Mountain is open on Thanksgiving week, and Sunday through Thursday (Thanksgiving Day) are traditionally manageable. Crowds pick up on the day after Thanksgiving (Black Friday) and through the weekend. Holiday in the Park – Be prepared for big holiday season crowds and long lines on the week of Christmas through December 30. Christmas Eve is usually manageable. Six Flags Magic Mountain is closed on Christmas Day. New Year’s Eve – The holiday crowds are gone by December 31. Magic Mountain traditionally isn’t crowded on New Year’s Eve. Lines are usually short. For crowd predictions of upcoming dates, as well as historical crowd ratings, check out the Six Flags Magic Mountain Crowd Calendar. For live crowd updates and conditions at the park, check out the Six Flags Magic Mountain Crowd Tracker. When do you think is the best time of the year to go to Magic Mountain? How crowded was it when you visited? We went to SFMM on MLK Day and it was empty! There were no lines for anything, you can just walk on to the coasters and ride multiple times. Do NOT buy a Flash Pass in advance online unless you know for sure that it’s going to be crowded. If you’re going during a non-busy time or the off season, just wait until you go to the park first and see how long the lines are. They have a Flash Pass booth inside where you can buy them if you think it’s worth it. out of Friday or sunday, what day would be best to go during the second to last week of august? I think Friday will be a little better. Weekdays at the end of August are usually quiet. Is it worth going the last weeks of august on a weekday even though the park closes earlier? Yes, I think it’s a good time to go since most of the summer crowds are gone by the end of August. You should have time to ride everything. I think it’ll definitely be more manageable on Monday. Weekdays during the summer season are your best bet for lighter crowds and shorter lines. Try to get there early! Any thoughts on July 7th? I’m hoping the crowds die down the Monday after 4th weekend.